Today I read that the St. Gerard's move is a step closer to coming true. We have talked about this before. That is Gerard's picture above. It is moving to Georgia! St. Gerard's used to be my church before the diocese closed it. That will surely be one of the biggest instances of a building being moved anywhere. It will be up there with London Bridge. It gives me shivers when I think about it. I told Howard, we will be able to talk about this on barstools the rest of our lives. How the church we got married in moved to Georgia. And what gives me shivers is, I remember saying that prayer. When I was in my car, passing St. Gerard's, on my way to the Clinton-Bailey Market. I said, "God, I love the church I am going to now but everything is not perfect because of St. Gerard's. I wish You would do something about it." I swear that is what I said! I continued, "I can't imagine what you could do with it. I have no idea. But I do not want it to rot and I do not want it to become a restaurant or a community center and I do not want it to become a Protestant church or a mosque or anything but a Catholic church. I want it to be a Catholic church. I can't imagine how You can make this happen but I know You can make it happen and I wish you would." Then something like three days later I find out about that move to Georgia. Then in the Western New York Catholic they had all this funny stuff that made me marvel at all of this. This guy down in Georgia told the priest there about this church he had grown up in and suggest they look up here for a church. The priest follows up and the diocese suggests Gerard's. Then lo and behold, that turns out to be the exact church the guy down in Georgia had grown up in. Not only that, but Gerard's resembled the plans the Georgia parish's architect had drawn up! I love stuff like this! It reminds me of when I found out that Leonard Pennario was baptized at the church I go to. I love coincidences like that. Back to Gerard's. Here is an editorial about it in the Western New York Catholic by Howard's Facebook friend Kevin Keenan. Keenan thinks as I do that the church should be moved. Some people want it to stay here but I say it is like the wisdom of Solomon. There was a baby two women were fighting over and King Solomon said fine, I will cut the baby in half and you will both get half. One woman said OK. The other said no, better the baby should go to the other woman than it be cut in half. And King Solomon in his wisdom awarded the baby to the woman who said no. She loved the baby more! 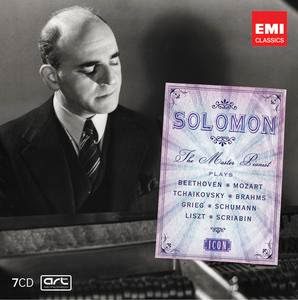 What about the pianist Solomon? I have a feeling that he too would have sided with me and King Solomon and Kevin Keenan on St. Gerard's! With which, here is our supernatural question for the day. We are not just going to tell stories this October. We are going to ask questions! Does anyone out there in Blog-O-Land have any instances like this one when you prayed for something and it made you shiver because you just knew your prayer was answered? It happened to me three times in my life that I can think of and this is one of them. In all three instances, this stands out in my memory, I said the prayer out loud. I am not saying I think it is necessary to say the prayer out loud but that was the way it worked in my case. In the Gerard's instance, I was alone in my car and I was just talking out loud as I sat at the light at Bailey and Delavan which, lucky for me, that is a neighborhood where you do not look weird if you are by yourself in the car and someone sees you talking. I know a lot of people were praying for that church but I am sure God heard me personally. I just know. It was just too funny for Him not to have. My demand was so out of this world! I mean, what I was asking for was impossible. I know that as I continued on to the Clinton-Bailey Market. I would love to know if anyone else has any stories like that. When you prayed for something and you just know your prayers were answered. When you knew there was something Out There, and it was bigger than you were. OK, I have had a 'life-changing' prayer answered but I have no blog, lol! This is not about a prayer, but this story come to mind anent the one about St. Gerard's. Groucho Marx swore it was true. When he and his brothers were in vaudeville, they worked for a brutal theater manager in some small town. Matters came to an impass over his bullying, and the brothers only agreed to do their show after a settlement was made with him. After the performance, they had little time to catch their train for the next engagement. The manager had their payment brought to their dressing room in sacks of pennies. Those pennies need to be counted and the brothers and their company almost missed the train because of that. They were furious. Harpo, who never spoke on stage, saw the grinning manager on the station platform. From the moving train, he shouted an obscenity at him and added "I hope your theater burns to the ground!" Groucho said they picked up a newspaper in the next town the follwing day and saw that that theater had burned to the ground in a fire the previous night. Groucho claimed Harpo was the only person he ever knew to call a curse down on someone and see it carried out. Anonymous (Prof. G?) what a story, about Harpo Marx and the theater! Tremendous. That will have to be a story for another day. Speaking of a story for another day, Larry has to tell us his prayer-comes-true experience ... Come on, Larry, please? It's happened to me, but not in such an interesting way. I'll tell you about it at Gary's sometime. 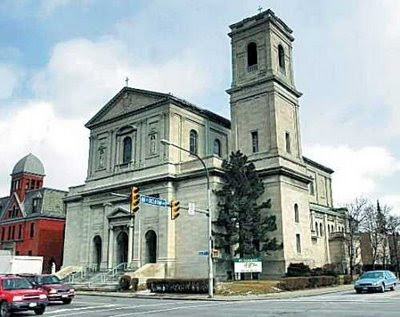 Hate to see such an historic and beautiful go but am afraid the Diocese would just let it fall apart where it is. There is not enough money available to Buffalo preservation to keep all the beautiful abandoned churches maintained. Also would hate to have them be used for some unworthy purpose.